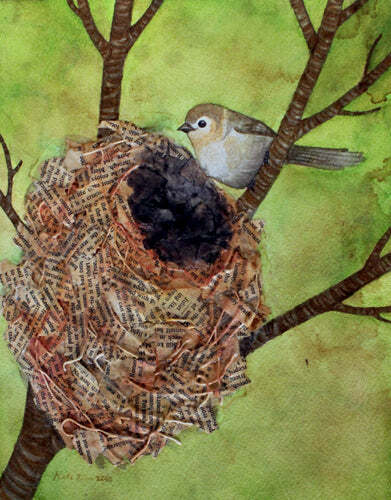 Here is a new bird nest painting, it is a Bushtit. A Bushtit's nest is typically made of moss, grass, twigs, lichens, small leaves, spider cocoons, and blossoms of trees. It seems this one has located an old book... well, the nests never were very accurate! But believe it or not, I actually look up what all of these birds nests are actually supposed to look like, that way I can at least get a *hint* of accuracy.